Sarah Wiseman Gallery is delighted to be exhibiting a new exhibition by Carol Peace, one of the U.K's most exciting talents in contemporary sculpture. 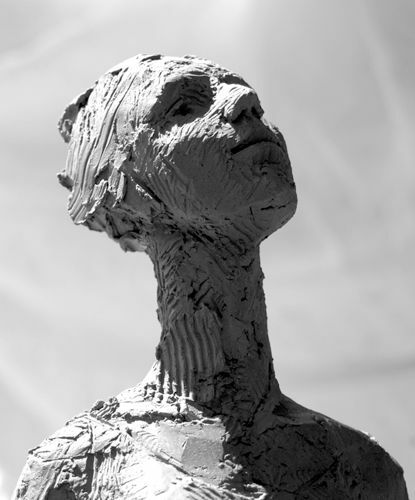 Renowned for her distinctive figurative sculpture, Bristol-based artist Carol Peace's work inhabits an inner world of self-reflection, or intimate connections between characters or figures, communicating unspoken understandings between ourselves, our loved ones and the world around us. Some of her sculptures are only a few inches tall; but resonate with immense power, probably because we recognise much of ourselves in her sculptures. Carol Peace is one artist whose work would not be in existence without drawing; her dedication to drawing is her work's distinguishing feature and is an integral part of the making process in her sculpture. Drawing well takes concentration and hours of practice and many artists feel it doesn't always go well. But Carol embraces these challenges; âI have always relied on life drawing and it's something I have fallen back on over and over, not just for its informative values but the fact it trips you up with the sheer difficulty of it. The struggle of just trying to capture what is in front of you honestly without technique or gimmick is healthy.' âMy inspiration is from everyday life occurrences, feelings, the way people behave and react towards one another' she explains. âI realised recently that my feelings, aspirations and desires are in fact the same as everyone's and that it is in fact themselves that they relate to in my work and therefore it is I guess ok to be personal.' Carol Peace studied at Winchester College of Art graduating in Fine Art Sculpture, before taking up a place at The Princes Drawing School in London. She then went on to found The Bristol Drawing School in 2007, where she was artistic director for four years. She is now a patron of the Royal West of England Academy. Carol has also created a number of public art commissions with permanent sculptures installed in locations around the U.K, and has exhibited her work nationally and internationally.